The phone call came bright and, from the perspective of a 24-year-old sportswriter who treasured his sleep, much too early. The gist, from my editor: Get up, get dressed, get down to Indianapolis. There’s a NASCAR “tire test” at the Speedway. Go cover it. Now. What had been rumored finally was taking shape on this June day in 1992. Nine of stock-car racing’s top stars – Davey Allison, Dale Earnhardt, Bill Elliott, Ernie Irvan, Mark Martin, Kyle Petty, Ricky Rudd, Rusty Wallace and Darrell Waltrip – were going to drive on the famed 2½-mile oval. This was much more than a tire test. (“We get as many as we want, right?” I heard Irvan quip on pit road.) It really was the first step in determining the feasibility of a NASCAR race at the Indianapolis Motor Speedway. As someone who grew up on the west side of Indianapolis, literally within earshot of the track, I always was interested in the Indianapolis 500. In addition to attending the race, I went to practice, qualifications and Carb Day, and also closely followed the IndyCar races throughout the season. Unlike others, I wasn’t necessarily opposed to “sharing” the track with stock cars. I found this first test extremely interesting, even with only a handful of cars circling the track at once. One of my main takeaways that day was how deep the NASCAR talent pool was – and it only seemed to be getting deeper. 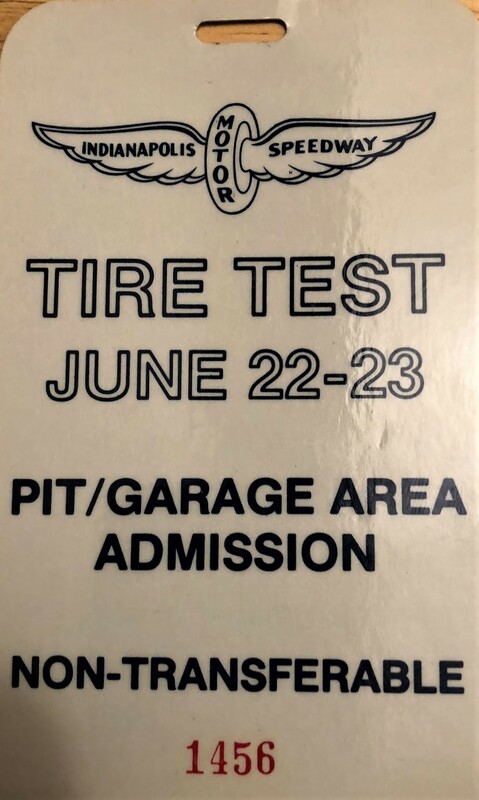 Keep in mind, this test, which drew several thousand interested spectators, was before NASCAR’s popularity was about to skyrocket. Big time. And before IndyCar’s was about to wane. Big time. Part of the reason why NASCAR started to overtake IndyCar during this timeframe was because of it’s growing driver star power backed by legions of passionate fans. IndyCar, on the other hand, couldn’t keep up. And although neither former winners Tom Sneva nor Gordon Johncock had officially retired, as it turned out, their last Indianapolis 500 starts were in 1992. IndyCar temporarily staved off NASCAR’s oncoming surge thanks to the arrival of Nigel Mansell for the 1993 season. The reigning World Champion demanded global interest and attention throughout the season, capped by him winning the IndyCar title as a rookie. Still, “Mansell Mania” only temporarily masked a problem in the IndyCar ranks: A growing lack of star power. And when Mansell left the series after the 1994 season ended, it became even more apparent. The pipeline of American IndyCar drivers began to dry out, something Tony George promised to fix with the subsequent formation of the Indy Racing League. Those who did make it to the Indianapolis 500 before the infamous split, like Jimmy Vasser, Robby Gordon and Bryan Herta, found it tough to displace the departed legends in the hearts of fans. NASCAR, on the other hand, found a new hero in Jeff Gordon. Gordon, who moved from California to Indiana to pursue his racing dreams, shined in USAC’s midget, sprint and Silver Crown divisions – once the key training ground for future Indianapolis 500 champions – before taking his talents to NASCAR. Without any offers from IndyCar owners, by the way. His first Cup start was … wait for it … in 1992. After winning the inaugural Brickyard 400 two years later, the popularity of Gordon and NASCAR seemed intertwined. And almost unstoppable. NASCAR truly became a nationwide phenomenon, with new events at new tracks across the country. By the end of the decade, Gordon was joined by Tony Stewart, another former open-wheel star from Indiana who had served the same old-school apprenticeship even more successfully, winning the midget, sprint car and Silver Crown national titles (all in 1995), plus the 1997 IRL championship. Today, though, Gordon and Stewart, who combined to win 7 Cup titles and 7 Brickyard 400s, are retired. So is Dale Earnhardt Jr. Carl Edwards stepped away. Retirement seems imminent for Kasey Kahne, too. Like IndyCar in the early 90s, NASCAR has seen several of its most popular drivers retire the past few years. And based on declining TV ratings and vast expanses of empty seats in the stands, it seems that NASCAR fans are not as passionate about the new breed of drivers. That’s not a dig at Brad Keselowski (the most recent Brickyard winner), Joey Logano or any other young(ish) driver. Several are tracking toward very respectable careers. But they, like their IndyCar counterparts from more than 20 years ago, seem to lack the “it” factor. Regaining that star power, rather than changing dates, is what truly will revitalize the Brickyard 400. Once a guaranteed full house, attendance has dropped steeply the past few years. Part of the reason, it was thought, was because people didn’t want to sit in aluminum seats under a glaring sun during the heat of the summer. So this year, the Brickyard 400 was moved to September. Moving the event to later in the season also meant the race was the final one of the “regular season,” so potentially playoff spots were on the line for NASCAR’s “Chase.” That, too, was expected to juice up interest. Because of rotten weather, we’ll never know if these changes would’ve worked. The Brickyard 400 finally was run on Monday before an understandably sparse crowd. Next year, weather permitting should be much better in terms of attendance. On the other hand, I find it hard to believe Indianapolis residents will abandon their beloved Colts in any great numbers to head to the race. Maybe NASCAR should try this: Push the Brickyard 400 back another couple of weeks until after the IndyCar season. Then guarantee spots for the Indianapolis 500 winner and the IndyCar champion. It just might be the injection of interest the Brickyard 400 needs.